The north east greengrocer hailed the Metric Martyr after being prosecuted for selling fruit and vegetables by the pound, has died suddenly aged 39. 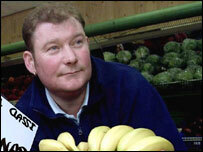 Steve Thoburn, a Sunderland market trader, was convicted for selling goods only in imperial measures in 2001. The group's appeals against conviction were rejected all the way up to the House of Lords and this February, by the European Court of Human Rights. Fellow campaigner Neil Herron told the BBC Mr Thoburn died at home on Sunday. Mr Herron said: "This man had the courage to stand up and be counted and it was a pleasure to know him. "He was an ordinary person's hero - an extraordinary ordinary person." Mr Thoburn became famous after his scales were seized from his market stall by Trading Standards officers who caught him selling bananas by the pound. It triggered a legal battle in which he was joined by four other traders - from London, Cornwall and Surrey - to fight European regulations requiring food traders to sell produce in metric measurements. Their legal battle was funded through the Metric Martyr Defence Fund, raised from donations by the public. The British Weights and Measures Association (BWMA), which campaigns against compulsory metric conversion, also paid tribute to Mr Thoburn and said their continued fight was dedicated to his memory. It said in a statement: "Steve Thoburn is indeed a martyr - he should be regarded as a national hero. "For his sake, we must succeed. It is damnable that he dies a criminal owing to these totalitarian regulations. "We will ensure that his brave fight for our much loved traditions will endure after his passing."